Pittsburgh Steelers quarterback Ben Roethlisberger suffered a left knee injury during Sunday’s 12-6 win against the St. Louis Rams and will now miss 4-6 weeks. An MRI on Sunday night revealed a sprained MCL and bone bruise for the two-time Super Bowl-winning quarterback. During Sunday’s Pittsburgh win, Roethlisberger was hit low and sacked by St. Louis Rams safety Mark Barron. Soon after the hit, Roethlisberger was replaced by Michael Vick. 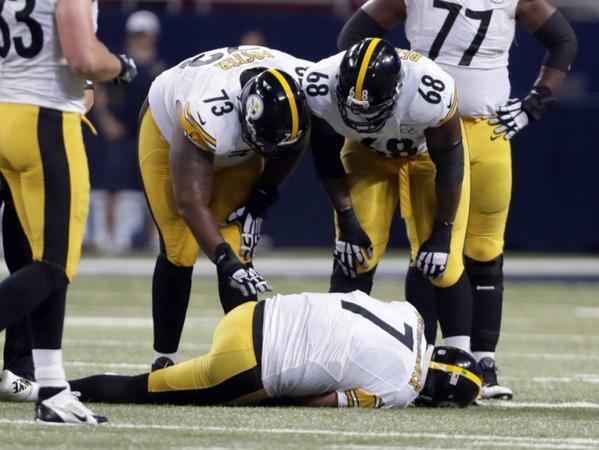 Roethlisberger will potentially miss games against the Ravens, Chargers, Cardinals, Chiefs, Bengals, and Raiders. The timing couldn’t be worse for the 2-1 Steelers, who now face an uphill climb in the AFC North without their quarterback to run a high-octane offense.